The gold medal winning performance of Abhinav Bindra in shooting at Beijing Olympics was received with delight by local residents. The suspension of a police station munshi on charges of power theft at the Shimla Puri police station is not really a big thing for police personnel as 15 of the 20 police stations and a majority of the 30-odd police posts are running on kundi connections. For five years, the authorities went through the rigmarole of laying a 7 km stretch of southern bypass and spent lakhs of rupees on fighting litigations against acquisition in various courts. 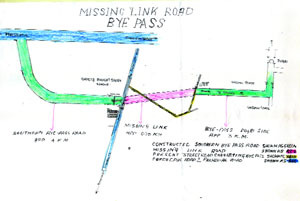 Now, the Greater Ludhiana Arbitrary Development Authority (GLADA) has refused to construct a 1 km connecting link of road, stating that the project was not viable. Vibrations from a hammering unit in ward No. 14 here has been causing irreparable damage to houses in near vicinity for the past many years. A number of complaints and representations to various government functionaries have fallen on deaf ears. 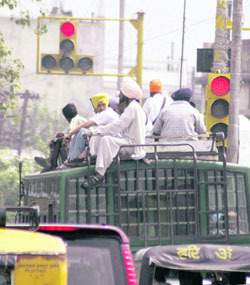 Cars, buses and trucks travelling at high speed, changing lanes at leisure; helmetless two-wheeler riders zooming through traffic; buses stopping at slip roads instead of specified halts; and pedestrians crossing intersections when light turns green for vehicles. Welcome to the chaotic city roads. 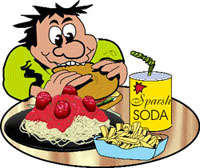 That the premier health institution of the region — Christian Medical College and Hospital — mooted the idea of setting up a juvenile diabetic club is an indicator to the sedentary lifestyle that youngsters in the city are following and falling ill. Addicted to fast food like burgers, pizza, candies and colas, and with little or no physical activity, children and adolescents are falling easy prey to lifestyle diseases. The observance of vanamahotsava fortnight has lost its meanings in this part of Malwa where owners of certain manufacturing and processing units continue to discharge toxic industrial wastes in forest department land along the Bathinda branch of Sirhind canal. Even as police stations in the district have been directed to obtain power connections forthwith, the fate of numerous cases of power theft registered against policemen with different police stations remains the same — these continue to gather dust and are never pursued in order to take them to their logical conclusion. 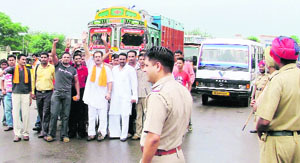 Activists of Shiv Sena (Bal Thackeray) youth wing today held a demonstration and blocked vehicular traffic near Jalandhar bypass on G.T. Road here to press their demand for restoration of land to the Shri Amarnath Shrine Board in Srinagar. The recent changes in the top leadership of Congress in Punjab have, for a change, not led to the race among the rank and file to take sides and fall over each other to pledge their support to the new leaders. Known to change their loyalties faster than the party workers change their “khadi” dresses, at least for the time being, the Congress workers here have adopted the policy of “wait and watch” before making it known as to which camp they belong. The dilemma among the ranks is understandable because in the prevailing state of affairs, it is tough to say as to who among former chief minister Capt Amarinder Singh, leader of the Congress legislature party Rajinder Kaur Bhattal, or for that matter Mohinder Singh Kaypee, the new party chief, has emerged stronger in the new setup. Kamagata Maru incident is again in the news as Indo-Canadians have rejected the apology of the Canadian Prime Minister tendered in public as they want it in the Parliament. As is well-known, Kamagata Maru was a Japanese ship hired by Malaysia-based wealthy Sikh Gurdit Singh to bring 376 Indians, mostly Sikhs, from Hong Kong to Canada on May 23, 1914 to challenge the racist laws. The dominion government did not permit passengers to disembark and the vessel remained docked at Vancouver harbour for two months. Ludhiana, August 11 G.S. Ghuman, newly appointed municipal corporation commissioner, today said he would not tolerate political interference in the functioning of the local body. Activists of the Berojgar BEd Teachers Front (Punjab), led by Ajit Singh Jassowal, handed over a memorandum to MP Sharanjit Singh Dhillon, chief parliamentary secretary Harish Rai Dhanda and cabinet minister Hira Singh Gabhria and zila parishad chairman Manpreet Singh Ayali. 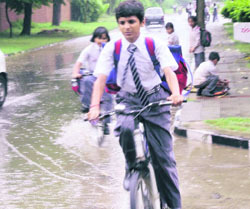 Government schools besides having poor infrastructure also lack in providing better standards of education. The buildings of government schools are in such bad state that students are forced to attend classes in the open. Scarcity of furniture, water, and laboratory equipments are some of the necessary items, which are neglected in the government run schools. Bakery items may record a fresh hike if a cost of raw material used by bakers continues to rise. Local bakers rue that costs have increased by roughly 20 per cent within the last one month itself. The Jugiana branch of UCO Bank has been rolled over to core banking system (CBS) or anywhere banking from today to provide state of the art services to its customers. A two-day research and extension specialists’ workshop for rabi crops was inaugurated at PAU by vice-chancellor Dr Manjit Singh Kang today. The three-member delegation from the Ohio State University, Columbia, have asked their counterparts at Punjab Agricultural University (PAU) here to implement a student centred learning programme. They observed since all the agricultural graduates in India could not be absorbed by the government agencies, they should be prepared in such a manner that corporate sector could offer them good job placements. Guru Nanak Dev Engineering College welcomed its new batch in its auditorium here today. The students were welcomed by principal Dr M.S. Saini. Others present on the occasion were the deans, heads of the departments and advisors of first year students. The students were shown a presentation on the college, showing the glorious history of the last 52 years. The new students were introduced to the advisory system and its benefits. They were also warned against creating indiscipline in the college. A project of Spring Dale Senior Secondary Public School has been selected for the national-level CBSE Science Exhibition - 2008 to be held at Delhi in September. A painting and on-the-spot colouring competition was organised at Jagannath temple, run by ISKCON, here today. As many as 80 students of different schools participated in the competition. Students of BA (final year) of colleges affiliated to Panjab University are confused over the "mismatch" of syllabus and the book prescribed for the English (compulsory) paper. Emphasis was laid on proper dental care and oral hygiene at a workshop organised by the local branch of the Indian Dental Association (IDA) in association with a multinational company at AS Modern Senior Secondary School, Khanna, on Saturday. Switching over to high protein variety of wheat in Punjab is telling on the health of children, who are coming to doctors with wheat allergy as they are unable to digest the protein. A team of health officials, led by Dr K.C. Goyal, SMO Malerkotla, took as many as nine samples of food items during raids conducted here today. The samples were sent to the office of state analyst at Chandigarh. Further action will be initiated against the owners of the establishments, in case the chemical analysis of the samples prove adulterated with inferior materials. Starting as a partner to ace shuttler, Raj Kumar, Pranav Chopra has now carved a niche for himself and is all set to give his best shot for the country. The duo of Pranav and Raj Kumar are the current sub junior national champions (doubles) after they overpowered their opponents to emerge victors at Dehradun, last year. Prabhjot Singh scored a hat-trick as Mehta Gurukul Academy of Doraha started its campaign in style with a 5-0 emphatic victory over Khalsa Academy of Bahadurgarh in the inaugural match of the annual Rakshak Punjab Schools Inter-Academy Hockey League (u-14) being organised by the Punjab School Education Board in asociation with Mata Sahib Kaur Sports Club at Jarkhar, near here, today.